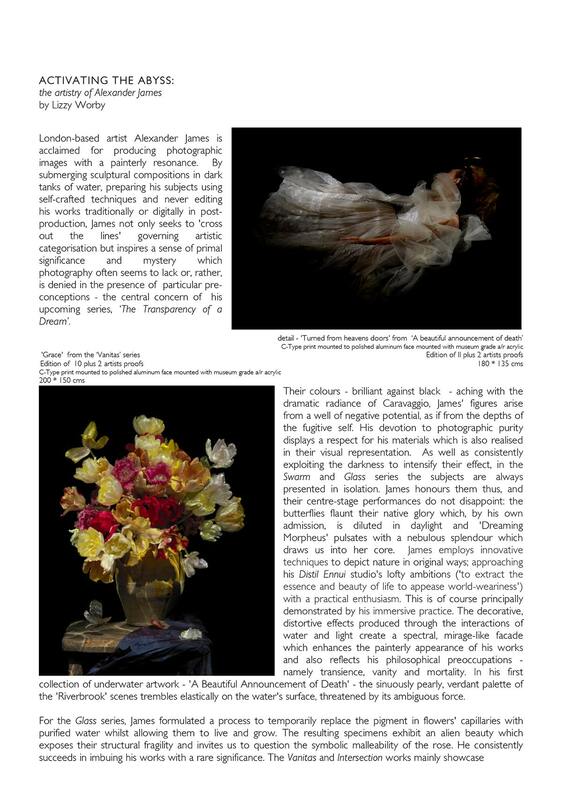 London-based artist Alexander James is acclaimed for producing photographic images with a painterly resonance. By submerging sculptural compositions in dark tanks of water, preparing his subjects using self-crafted techniques and never editing his works traditionally or digitally in postproduction, James not only seeks to 'cross out the lines' governing artistic categorisation but inspires a sense of primal significance and mystery which photography often seems to lack or, rather, is denied in the presence of particular preconceptions - the central concern of his upcoming series, ‘The Transparency of a Dream’. Their colours - brilliant against black - aching with the dramatic radiance of Caravaggio, James' figures arise from a well of negative potential, as if from the depths of the fugitive self. His devotion to photographic purity displays a respect for his materials which is also realised in their visual representation. As well as consistently exploiting the darkness to intensify their effect, in the Swarm and Glass series the subjects are always presented in isolation. James honours them thus, and their centre-stage performances do not disappoint: the butterflies flaunt their native glory which, by his own admission, is diluted in daylight and 'Dreaming Morpheus' pulsates with a nebulous splendour which draws us into her core. James employs innovative techniques to depict nature in original ways; approaching his Distil Ennui studio's lofty ambitions ('to extract the essence and beauty of life to appease world-weariness') with a practical enthusiasm. This is of course principally demonstrated by his immersive practice. The decorative, distortive effects produced through the interactions of water and light create a spectral, mirage-like facade which enhances the painterly appearance of his works and also reflects his philosophical preoccupations - namely transience, vanity and mortality. In early works such as 'A Beautiful Announcement of Death' - the sinuously pearly, verdant palette of the 'Riverbrook' scenes trembles elastically on the water's surface, threatened by its ambiguous force. For the Glass series, James formulated a process to temporarily replace the pigment in flowers' capillaries with purified water whilst allowing them to live and grow. The resulting specimens exhibit an alien beauty which exposes their structural fragility and invites us to question the symbolic malleability of the rose. He consistently succeeds in imbuing his works with a rare significance. The Vanitas and Intersection works mainly showcase compositions of assorted objects which, again because of the play of water and light, sustain an abandoned, shipwrecked aura. Aside from their memento-mori relevance, they act as pictorial vessels harbouring a undisclosed and unknowable past; seducing the viewer with their mysterious promise. Rather than pursuing vapid feats with contemporary vigour, James has invested in a painstaking methodology: constructing every scene, he does his editing in-front of the camera - controlling and utilizing the peculiarities of the underwater conditions to achieve 'perfection' within a limited timeframe. 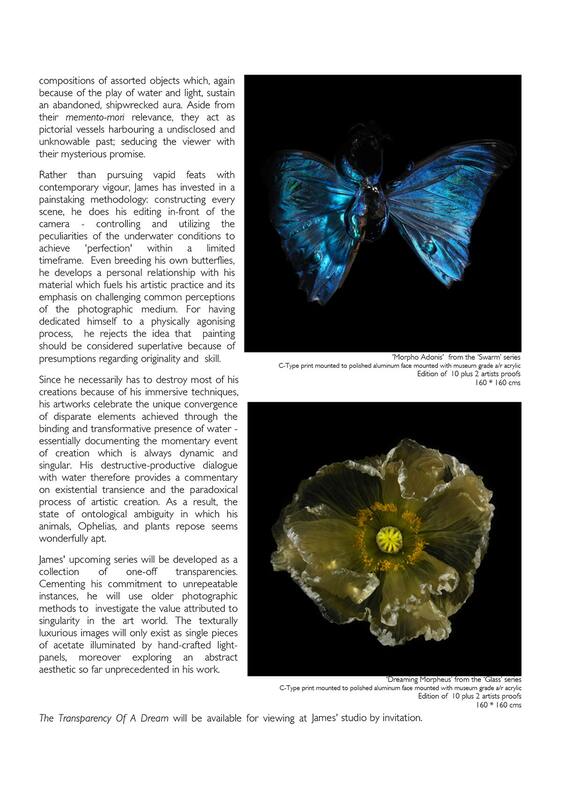 Even breeding his own butterflies, he develops a personal relationship with his material which fuels his artistic practice and its emphasis on challenging common perceptions of the photographic medium. For having dedicated himself to a physically agonising process, he rejects the idea that painting should be considered superlative because of presumptions regarding originality and skill. Since he necessarily has to destroy most of his creations because of his immersive techniques, his artworks celebrate the unique convergence of disparate elements achieved through the binding and transformative presence of water - essentially documenting the momentary event of creation which is always dynamic and singular. His destructive-productive dialogue with water therefore provides a commentary on existential transience and the paradoxical process of artistic creation. As a result, the state of ontological ambiguity in which his animals, Ophelias, and plants repose seems wonderfully apt. James' upcoming series will be developed as a collection of one-off transparencies. Cementing his commitment to unrepeatable instances, he will use older photographic methods to investigate the value attributed to singularity in the art world. The texturally luxurious images will only exist as single pieces of acetate illuminated by hand-crafted light panels, moreover exploring an abstract aesthetic so far unprecedented in his work.